Looking to make noise once again this month, the Jordan Brand is set to release a new colourway of one of their popular fusion sneakers this July. 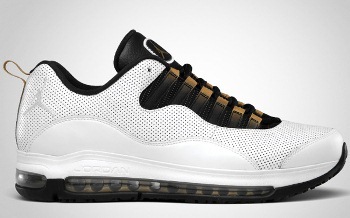 The Jordan CMFT Air Max 10, which is a combination of the Nike Air Max 97 and Air Jordan 10 silhouette, will come out in White/Metallic Gold-Black, which resembles the Steel Grey edition of Air Jordan 10. The new edition of this model feature perforated white leather upper part with black and gold accents on lace area. Just like the previous colourways of this shoe that hit the stores this 2011, expect this shoe to be one of the hottest item this month despite its simplicity.